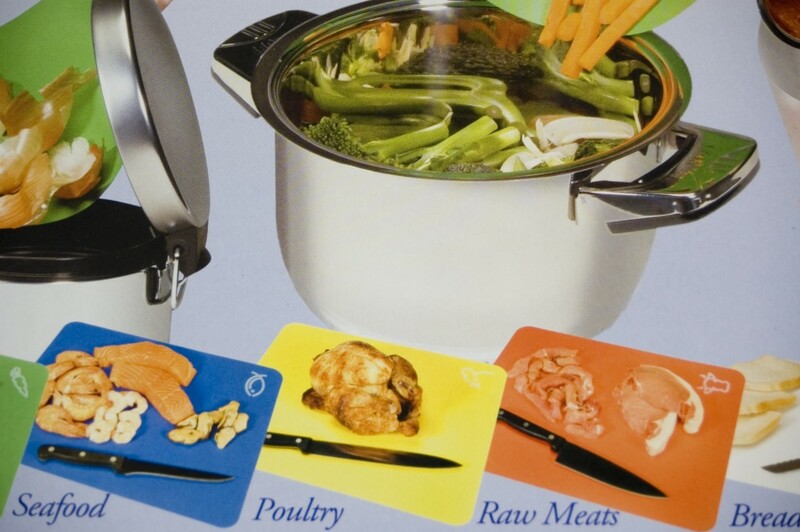 Set of five colour-coded flexible silicone chopping and cutting mats. Colour coded for improved hygiene and prevention of flavour transfer. Green, blue, yellow, orange, and white mats supplied (one of each colour per pack).You can use separate mats for seafood, raw and cooked meats, poultry, vegetable etc. These mats can be rolled up to store in a small space, so they are ideal for use in small kitchens, caravans and camper vans. Because these mats can be rolled up they can also be used as a funnel for pouring the food after cutting, chopping or dicing. Easy to clean, just use hot soapy water, rinse, and dry. Dishwasher safe. These mats are suitable for bleaching to remove strong stains but be sure to rinse well afterwards.Not for use on hot surfaces. Do not stand hot pots or pans on these mats. Dimensions: Length 385mm Width 304mm Thickness 1mm.